Last week’s article explored the significance of an unaspected natal Sun in relationships. This week, I’ll look at the unaspected Moon (the same orbs and criteria noted in the previous article hold true). If your Sun is the conscious expression of will, your Moon is the unconscious expression of instincts and emotions. It represents what you need to feel secure, and how you protect yourself when you feel insecure. In relationships, the condition of your Moon indicates how you respond, on an instinctive level, to your partner. Aspects between your Moon and other natal planets integrate unconscious behavior into your psyche. The Moon’s responses are tricky at the best of times, because most people do not have a full awareness of it. But when it’s unaspected, it can become an unstable blind spot. Your Moon, with its sensitive nature and fluctuating cycles, is not static. Think of how the Moon in the sky cycles from New to Full and back again. A natal Moon in a Fixed sign will have slower fluctuations than a Cardinal or Mutable Moon. But everyone’s Moon has a degree of instability. The Moon’s aspects to other natal planets act as releases, anchors or blocks for that changeable energy. Your unaspected Moon has none of these, so your emotional nature is all-or-nothing; hypersensitive and needy one moment, shut down and self-protective the next. All lunar characteristics are pronounced, because your feelings are undiluted. Along with this well of pure instinct is a restless urge to find security, as you constantly search for “home” in your relationships. The Moon also represents your experience of your mother. Women with an unaspected Moon may find it challenging (but not impossible) to express maternal instincts. The template of nurturing was absent or damaged in childhood, and this area may be foreign territory. A man with an unaspected Moon may find it difficult to relate to women on an emotional level, as he has no idea what kind of woman he feels comfortable with. Emotional reactions are unpredictable in both sexes. There is also a constant, low-level “hum” of neediness that your partner perceives, but can never seem to satisfy. All domestic matters (such as creating a home and having children) can be steeped in insecurity. You’re groping around, trying to figure out how these things are done while wrestling with your own sensitivities. When a partner’s planet aspects your unaspected Moon, they become the primary influence on your feelings. This can be positive or negative, depending on how they (and you) handle that energy. Any unaspected planet is much more vulnerable to external influences than an aspected planet. So your partner’s impact will be emphasized. In some ways, an unaspected Moon is even more vulnerable than an unaspected Sun. A trine from your lover’s Saturn (rules and authority) can feel wonderfully stabilizing. They’re your rock, giving your chaotic emotions form and structure. However, even with a harmonious aspect like the trine, there’s a risk of you becoming dependent on them. This can be an intensely bonding influence that leaves you feeling adrift when the Saturn person isn’t around. Their rules can literally shape your needs. In extreme situations, they can control the ebb and flow of your emotions. The Saturn person needs to resist the urge to act as parent or emotional manager. If your partner’s Mercury (communication) conjuncts your Moon, they’re your phone line to the outside world. Not only do they put your formless instincts into words, there’s likely to be a mutual connection that verges on psychic. This can be addictive, because you’ve finally met someone who understands you at the deepest level. However, it can also feel intrusive, as if the Mercury person is peering into you. If an analytical/investigative sign like Virgo or Scorpio is involved, you may feel like you’re constantly under your lover’s microscope. There’s a risk of the Mercury person telling you what you feel. Sensitivity (and some detachment) is needed on the Mercury person’s part, since this connection can put you “inside” each other. You feel what they’re thinking, and they read your heart. Your unaspected Moon holds the seeds of a special talent or ability (described more fully by the house and sign it’s in). Since this is pure instinct, all the lunar themes of caring, nurturing and empathy are at full strength. Despite any doubts you may have about your ability to nurture, it is your strength. Once these abilities are developed through relationships — plus any transits and progressions that trigger your Moon — you can become the source of comfort and healing for those around you. You’ll be the one they turn to as Mother (whether you’re male or female). Understanding that you have a concentrated pool of lunar energy within you makes it easier to maintain some autonomy when your partner’s planet(s) aspect your Moon. They can help unlock your emotional strengths, but you’re the primary source. To what extent does ‘house overlays’ work in synastry, especially for luminaries, in comparison to aspects between planets and planets/angles. (eg. Moon is other’s house 7). Can the moon of A show up in the relationship merely by being in B’s house (by overlay) without major aspects to any planet/angle of B? Yes, but it will make the most impact on person B if person A’s Moon hits their 2nd, 4th, 7th, 8th or 12th Houses. But even then, with no major aspects, it will be a generalized influence for person B.
I have an unaspected Leo Moon in the 8th. Your article is very true – especially, in my experience, the part about the mother and the absence of nurturing in childhood. My husband has an unaspected Pisces Venus in the 6th. Interestingly, our unaspected Moon and Venus are in a tight inconjunct with each other. 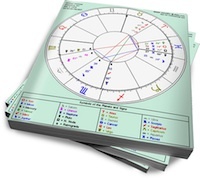 Other than that, there is only one other major aspect to each in our synastry – his Uranus conjuncts my Moon and my Jupiter opposes his Venus. Because of that, I would say I have had to take complete ownership of my unaspected Moon issues instead of relying on him to do it for me. Looking forward to more of your articles on unaspected planets (Venus)! I wrote an article on Unaspected Venus a few years ago. Search for “Rogue Venus” in the archives. Will check out the Rogue Venus article, Nadia. Do you consider an inconjunct a major aspect? Also, is it uncommon to have both people in a relationship having unaspected natal planets, as well as to have those unaspected natal planets making no or little contact within their synastry?